As an employee of interlinkONE, I am certainly excited about the ways that businesses are using mobile marketing to make their printed materials interactive. For example, my colleague, Michelle Jollymore, posted an article about QR Codes and direct mail today. Another way that companies are integrating mobile and print is by using “send a text message” as the call-to-action on a printed piece of material. Last night I received a mailer from one of my favorite stores – Hannaford‘s. The mailer provided cut-away coupons that people could take advantage of this upcoming weekend. 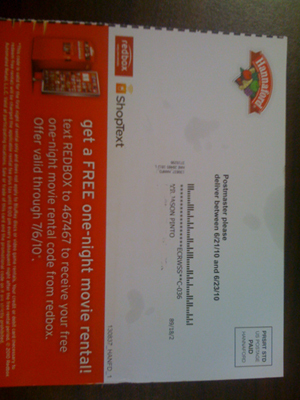 But there was also an offer on the back for people to pick up a free movie at a RedBox station while they were at the supermarket. In order to qualify for the free movie, people were asked to send a text specific message to the number provided on the mailer. I love this type of approach because it does add a level of interaction to a piece of mail. In the end, they are really using print and mobile to drive traffic to their stores. Hannaford’s, I’ll see you this weekend.